Welcome to Ruby, AZ. Unlike many ghost towns, there's no mystery about the origins of Ruby or what happened to it. On the contrary, it has been studied and well-documented for years. People who lived in Ruby during the boom times are still alive and occasionally hold reunions. Their accounts over the years of life in Ruby give us a rich picture of this now empty town. Also unlike many ghost towns, there are lots of buildings and structures in Ruby and you can explore all of them. You can even look into the mine due to a partial collapse of a hillside. If you like ghost towns, you'll love Ruby and its story. The road into Ruby. The schoolhouse has been partially rebuilt and is in pretty fair shape. You can walk through the entire three rooms. Parts of it look like people just walked away and never came back. Ruby was originally called Montana Camp and supported the Montana Gold Mine which opened in 1877. 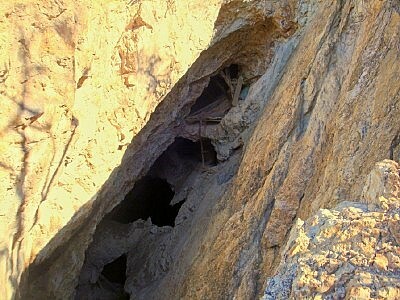 They were located in a southeast Arizona mining region called Oro Blanco, which is Spanish for white gold. Early Spanish explorers found gold on the Mexican border in the mid-1700's. It was a type of ore called "amalgam" in which the metals are blended together. The gold ore found in this region had a high concentration of silver. This gave it a shiny white appearance, hence the name. Gold locked up in amalgam had to be extracted through one of a number of processes. All of them were difficult and expensive. Some, involving the use of mercury and cyanide, were downright dangerous. That's the main reason that few of the thousands of mining claims in the Oro Blanco turned a profit. The best way to make money from gold in the Oro Blanco was to buy a claim, get a little surface gold out of it, then sucker somebody else into buying it at a greatly inflated price. Many mines went through numerous owners and name changes. Name changes helped sell unproductive mines. At any mine at any given time, there always seemed to be investors, prospectors and companies ready to buy old claims or stake new ones in the hopes that they could strike it rich when others hadn't. Ruby's own Montana Mine was no exception. The other big profit killer was the Apache. This was their homeland and they defended it violently. Over the course of a century - from the mid 1700's to the mid 1800's - they drove out the Spanish, then the Mexicans, then the Americans. Prior to the Civil War, the Oro Blanco was practically empty and mining was at a standstill. Prospecting with the Apache leader Cochise around was a death sentence. After the war, the army returned in force. 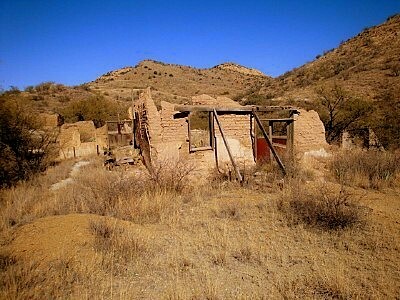 When Cochise surrendered in 1872, the Oro Blanco was safe enough for prospecting and exploring again, although raids by Apache and border renegades continued until the 1920's. The Arizona-Mexico border was a rough and dangerous place for years after the rest of the western U.S. had been settled. The Montana Gold and Silver Mine officially opened for business on April 10, 1877. The entrance to the Montana Mine with Montana Peak, elevation 5,370 feet, in the background. The big earthquake of 1887 tore giant slabs of rock off the peak, giving it its current appearance. The mine was honeycombed inside Eggshell Mountain, which is covered with trees, but there was only one way in and out. Various owners worked the Montana Mine for three decades to strike it rich with gold. Along the way, they faced renegades, Apaches, a big earthquake, bad roads, no water, flash floods, U.S. government interference, market gyrations and unscrupulous land speculators. In the end, none made any money. Most of what they dug up was lead. There was gold there alright, but it was so expensive to dig, transport and process that it ate up all the profits. By 1900, Montana Camp and its mine were just about played out in all respects. If Ruby had depended on gold for its future, it would have been lost to history over 100 years ago. At the turn of the 20th century, the market for lead showed signs of life and so did Montana Camp. It was renamed Ruby, the name of a store proprietor's wife, when they got a post office in 1910. Still, times were hard. From 1910 to 1926, Ruby's mine went through another succession of owners who had no better results than their predecessors. But the worst was yet to come. The front of the Ruby Mercantile. 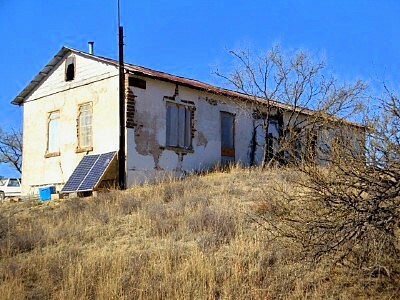 A large building, it was also the Post Office, the gas station and housing for the owners. In its prime, it had electricity, running water, acetylene gas heat, screened wrap around porchesand the town's only telephone. A commune of hippy squatters in the 1960's tore the place apart for firewood. Ruby's close proximity to Mexico made it a target of the border violence that was common at that time. This led to two double murders. Both times the victims were the owners of the Ruby Mercantile, the largest and most profitable general store in the Oro Blanco. Brothers John and Alexander Fraser were killed in a robbery by two Mexican bandits on February 27, 1920. They had only owned the store for 11 days. Frank and Myrtle Pearson bought the store after the Fraser murders, figuring it couldn't happen again. On August 26, 1921, it did. In a particularly brutal and vicious crime, the mercantile was robbed by seven banditos. The Pearsons were gunned down after Myrtle was pistol-whipped to knock out her gold teeth. This happened in full view of the Pearson's two daughters and Myrtle's sister. They were able to flee with minor injuries and report the crime. The subsequent hunts for the killers were the stuff of novels. They were massive with posses, chases, shootouts, escapes, big rewards, dead or alive wanted posters, army troops, federal agents and the first use of airplanes in a law enforcement manhunt. Justice caught up with the two Fraser murderers. One was killed in a shootout. The other was imprisoned in Mexico for another murder but was never held accountable for the Fraser killings. Of the seven killers involved in the Pearson murders, one was hanged and another served life in prison in Arizona. The rest were never caught. The store was closed for a while but soon reopened under new ownership just in time for Ruby's turnaround. Calling all lawyers. Geowife KidsRN, lovely and gracious as ever, stands at the foot of the Ruby school sliding board. It stands almost 20 feet high with no protective railing up the steps. 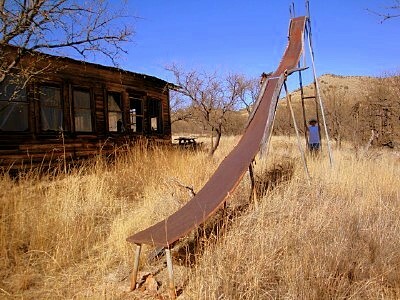 The slide is made of sheet metal with exposed rivets. The side rails are made of wood. Ouch! Well, this is the wild west. McQueen's character could have been talking about Ruby. Its fortunes took a dramatic turn for the better in 1926 when the Eagle-Picher Company of Joplin, Missouri came to town. Eagle-Picher didn't come for the gold. Their business was lead and that's what they were after. They made a major investment in the Ruby mine and it paid off. From 1926 to 1940, Ruby was a full-fledged boom town. Ironically, some of their best years were during the Great Depression. At its peak in the late 1930's, Ruby had 1,200 residents and covered 400 acres. They had several mercantile stores that supplied other mines and towns in the region. In fact, the stores were more profitable than most mines. That was another way to make money in the Oro Blanco. Ruby had much of what you might expect in a small town. They had a grade 1-8 school with four teachers and 150 students. The only doctor for miles around was in Ruby along with a small hospital. There was a courthouse, a jail, pool hall, saloons, stores, bunkhouses for single workers and housing for families. Much of it was in tent cities. Kids played. Babies were born. People died and were buried in the Ruby Cemetery. Parts of town had names like "Hollywood" and "Snob Hill." There were socials, baseball games and farmer's markets. Movies were shown at the pool hall. Church services were held in the school by a circuit preacher. Some of the residents had cars, so Ruby had a gas station in front of the mercantile. There was also a downside. After all, this was a mining camp in the middle of nowhere. The roads in and out of Ruby were terrible. Running water, indoor plumbing and electricity were scarce. Outhouses were the norm. The noise from the mine and its industrial facilities was deafening and echoed through the canyon 24 hours a day. In fact, the quietest place in Ruby was deep inside the mine. It was impossible to keep anything clean since mine dust like fine talcum powder settled on everything. Ruby's water supply was always a problem. To solve it, two dams were built to gather rain and run off, eventually forming two small lakes. When these proved insufficient, a four inch pipeline was run from the Santa Cruz River 16 miles away. The lakes and dams are still there today. The Montana Mine entrance and support structures. Everything and everybody went into and came out of the mine here. The shaft eventually reached down 700 feet and still does. Eagle- Picher's emphasis on lead partially accomplished what alchemists tried to do for centuries - turn lead into gold. Then there was the mine itself. At its peak production from 1934 to 1940, it went straight down 700 feet via a single main shaft. Underground there were nine main horizontal shafts at different depths. These were as long as 2,000 feet. Smaller shafts branched off from these as the miners followed the ore veins. The entire Eggshell Mountain was honeycombed with mine shafts. This eventually resulted in ground subsidence and collapse over the entire hill, making it dangerous to walk on. The Ruby map from the caretaker has it marked as a hazardous area that should be avoided. Using dynamite, hand tools and carbide headlamps, 300 miners worked shifts 24x7 for $2.50 to $5.00 a day. The company had a solid safety record. No mining fatalities were recorded during the Eagle-Picher era. Between 1928 and 1940, the company mined almost 800,000 tons of ore. After processing on-site and in Texas, it produced 31,000 tons of lead worth 4.5 million dollars. Interestingly, two byproducts of the lead processing were silver and gold. During those boom years, Eagle-Picher salvaged 120 tons of silver and 1.5 tons of gold. That alone almost paid for the mining operation, making the lead much more profitable. By turning Ruby into a lead mine, they recovered more precious metal than any other owner. Then it was over. In late 1939, the mine finally ran out of readily recoverable ore. Eagle-Picher didn't mess around trying to salvage or re-tool the operation. They shut down the mine in May 1940 and Ruby started to empty out. The Post Office hung on for another year, finally closing on May 31, 1941. Over the course of the next three years, the company removed some equipment and tore down many of the buildings, leaving things much as you see them today. In 1944, Eagle-Picher sold the claim to a 55 year old miner from Nogales named Hugo Miller, who was determined to coax some more metal out of the Montana Mine. Miller loved mining and had done it all his life. He never made much money but he worked the Ruby claim until his health started failing in 1961. Only then did he sell his mine and get out of the business. Purchased in 1945 for $5,000, he sold it in 1961 for $75,000. He died in March 1963 at age 74. 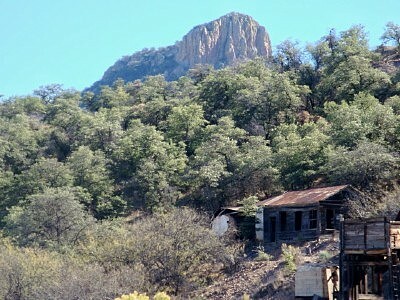 The sale of Miller's mine ended 84 years of mining in Ruby and marked the beginning of Ruby's ghost town present. However, the mining bug wasn't dead just yet. The old courthouse, which also served as office space and a guest house. A circuit Justice of the Peace from Santa Cruz County held court here. Although it may not look like it, it has been partially reconstructed and stabilized with grant money. The current caretaker lives in back and works out of here. This is where you'll pay your fee. The new owners weren't miners. They were families from Tucson who purchased Ruby as a private getaway. One of the first things they did was place Ruby off limits. They fenced it in, posted it "No Trespassing" and protected it with an armed caretaker who lived there. It wasn't long though before the new owners got gold fever and began to envision bigger and better things. Over the next 20 years, there was a wide variety of ideas and proposals. Convinced that new technology could get gold that was previously inaccessible, the new owners incorporated as the Ruby Mining Company. At various times, they also looked at turning Ruby into a movie set, private resort, hunting club or RV park. None of them ever happened. That was certainly good news for the hippy commune that took over Ruby in the late 60's. History hasn't recorded how a bunch of hippies occupied Ruby for several years with an armed caretaker on the premises. It also begs the question of how said hippies ripped up most of what was left of the town for firewood while the Forest Service was keeping an eye on them. By the time the commune was evicted in 1971, the wooden structures of Ruby had been decimated. The owners began emphasizing preservation over profit to save what was left of their town. This time, their ideas bore fruit. 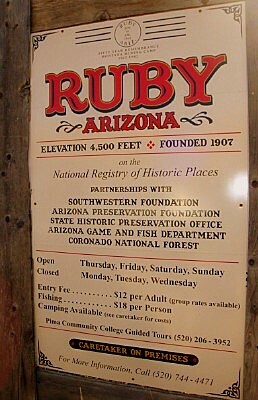 In 1975, Ruby was listed in the National Register of Historic Places. in 1993, the Arizona State Parks Board awarded Ruby a grant to begin restoration efforts. The emphasis was on secure perimeter fencing and building stabilization. Since 2000, Ruby has worked with both federal and state wildlife services to survey and protect the ecosystem, with an eye towards declaring Ruby a wildlife refuge. Those efforts are ongoing. Here's one of the coolest pictures I've ever taken - the Bat Cave. This a collapsed portion of Eggshell Mountain. 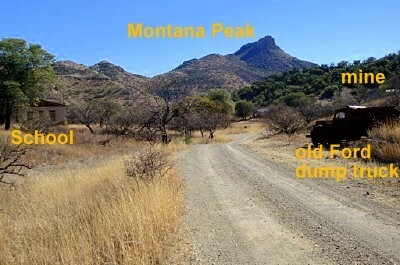 It is a short (and safe) walk along a dirt road uphill from the mine entrance. You can clearly see the honeycomb of shafts and levels of the Montana Mine. They keep going down into the darkness but the edge was too unstable to risk a closer look. With binoculars and proper light, you can see timbers, hopper cars and railroad track. This is where the Mexican freetail bats swarm from May to September - 150,000 of them. Make arrangements with the caretaker to view it. He can also tell you where to find this. In 2007, Ruby was awarded a grant by the Southwestern Foundation to stabilize and rebuild the school and the courthouse. That work continues to the present time. In 2009, Ruby was granted non-profit status as a 501c3 organization called the Ruby Mines Restoration Project. It can now accept grants and donations from a greatly increased number of sources. One of the covenants is that there can never be any mining in Ruby again. The water quality of the lakes has improved considerably and they are now open to fishing. They are not stocked but have been naturally seeded with bluegill, catfish and bass from flash flooding and run off from surrounding lakes. The most famous residents of Ruby these days are the 150,000 Mexican freetail bats that live in the old mine shafts from May to September. They blacken the sky for 10 minutes when they leave at dusk and return at dawn. Biologists estimate they eat 1,000 pounds of bugs per night. Ruby now has visitation arrangements that allow people to see this spectacle in season. Ruby was a major contributor to the history, economy and culture of the Oro Blanco. It is currently in a state of "arrested decay" while the school and courthouse are worked on. Its current owners, still the families in Tucson, are to be commended for their preservation efforts. The town's story is still being written. Ruby is worth saving. The sign at the entrance to Ruby. After being off limits for years, Ruby can be visited again. The photo to the left has all the details. We weren't sure what we would find when we got there, but the sign is accurate. We initially raised an eyebrow about a $12 per person admission fee but it was well worth it. There is a care taker in residence and he will collect the fee. It's cash only and exact change is appreciated. All the money goes to the Ruby Mines Restoration Project so we gave a little extra. He's also got a map and information about Ruby and will be happy to answer your questions. After a couple of hints and cautions, you're on your own to explore Ruby. We spent half a day there and still didn't see all of it. Ruby isn't easy to get to and it's not really on the way to anything. It's 50 miles southeast of Tucson and four miles from the Mexican border. It sits in the middle of the Coronado National Forest at an altitude of 4,500 feet. The best way to get there is to take the Ruby Road south out of Arivaca. The road is partially paved but becomes a dirt road when it enters the National Forest. It's rough, stony and prone to flash flooding, but passable in a passenger car except during the rainy season. It takes about an hour to drive the 12 miles from Arivaca to Ruby. You can drive around in Ruby itself. It makes exploring much more efficient to drive between areas of interest and then walk. If you want to fish, you don't need a license since it is private property. When you go, remember, this is the Arizona back country. Make sure you've got lots of water, sun screen and a hat. A stout walking stick is also recommended. Watch out for plants and animals that stick, sting and bite. There are lots of rattlesnakes in the summer. Flash flooding often occurs after rains. 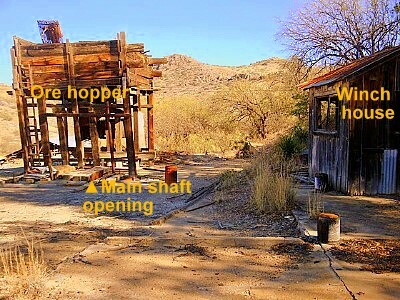 In Ruby, old mine shafts, uncovered wells, unstable buildings and ground subsidence can present additional hazards. The caretaker can give you specifics. There's no cell phone coverage here unless you hike to the top of a mountain. No store. No gas. No water. Be sure to bring everything you might need. Also be aware that the only facility in Ruby is an outhouse - just like the good ole days. 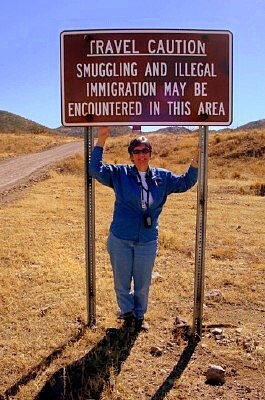 Be prepared to see the Border Patrol. They are everywhere. We chatted with several of them and found them to be very courteous and professional. We've got good people on the border. Welcome to the kinder, gentler Oro Blanco. We were going to add geocaching to the list but forgot our spray paint. These signs are all over southern Arizona. The reality is you'll probably see more Border Patrol than anybody else. That's the Ruby Road on the left, headed towards the town. Also be aware that illegal immigrants, smugglers and drug runners are active in this area. We didn't see any. According to the Border Patrol, things have really quieted down over the last year or so. The biggest risk on the winding dirt roads is someone coming around a curve or over a hill on the wrong side of the road and/or at high speed. Be wary at these blind spots and watch ahead for the approach of vehicles or telltale dust clouds. Also watch these same areas for open range cattle, which go where ever they want and don't leave dust clouds. Since this is a geocaching website, I should say a few words about geocaches in Ruby. There aren't any. We're going to remedy that next time we go out. I don't think that putting physical caches in Ruby is a good idea, so we'll put something nearby. It's too bad that Geospeak got rid of virtual caches and photo caches. Ruby is tailor- made for those. Nevertheless, whether it be a cache, a waymark, a challenge, an earthcache or a benchmark, Ruby should have something for us explorers to go after. In the meantime, you can hunt the dozens of geocaches on the way to Ruby at places like Rattlesnake Canyon, the Yellow Jacket Mine and Arivaca Lake. Don't rely on smart phone apps to navigate or geocache. Our Garmin Dakota 20's, which we rarely use in Minnesota, got a real workout in Arizona. If you're hungry after all this, check out the Outlaw BBQ in Amado, AZ. Leaving Ruby, return to Arivaca, then head 23 miles east on the Arivaca Road. It comes out at Exit 48 of I-19 and the Outlaw is right there. You'll drive right by it on the left. It's a friendly little hole-in-the-wall that has some of the best brisket and pulled pork we've ever eaten. I hope you'll get out to Ruby sometime and that you like it as much as we did.